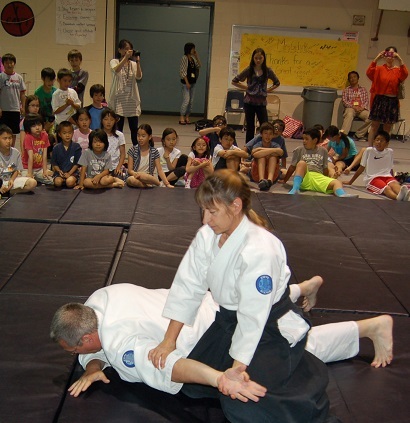 On Sunday, June 1st, we took part in the annual Japanese School of Denver Aikido demonstration, led by Izawa Sensei of Tanshinjuku Aikido dojo. I think this was our third or fourth time attending, and as usual it was great to feel the energy of so many children, from very young to teenagers. Seeing their smiles, hearing their excitement, watching their joy as they tried something new — pricelesss. Special thanks to Izawa Sensei for the invitation. 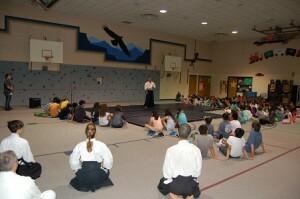 It’s always wonderful to spread awareness of Aikido. Thanks also to Charles-san for attending and being uke in our short demo.